This method is similar to that at The Loincloth of Borneo, and it works best with material that's at least 3 yards/2.75 meters long. I prefer using around 4½ yards/4 meters or so myself, but the exact amount you'll need depends on your waist size, how elastic the material is, and personal preference like flap length. 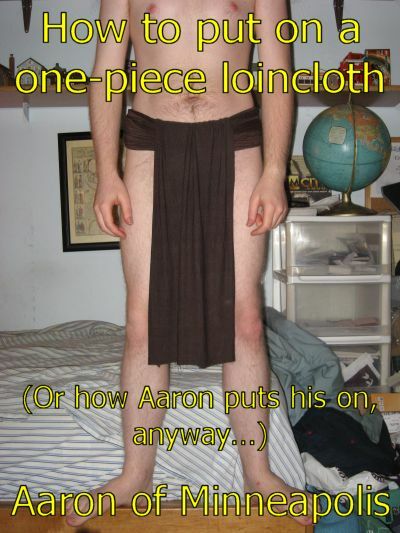 When making this kind of loincloth, you should probably make it too long in the beginning (an extra half-yard/half-meter of material), so you can trim it to the length you want. As for how to get straight edges: Many knit materials are ridged on one or both sides, which makes for a handy cutting guide if you use a steady hand and good light. Also, most woven materials are easily torn in a straight line, especially with a small cut at one end to start the tear.